Over the last month, I have been using the Sleepy Head software, and as usual for me, I have been doing a bit of experimenting. My AHI is usually below 4 using a pressure setting of 15cm H2O. I usually have the humidity set at 2/5. As the pressure is quite high, and using nasal pillows, my "snotbox" can get a little dry by morning, so I started turning the humidity up... in stages over a week or two, right up to 5/5. My AHI went up in stages to match, up to an AHI of over 9 on a humidity setting of 5. Most of the recorded events on higher humidity settings occur after 4 hours of sleep, every night. This would tie in with the higher humidity levels having time to build up. I cannot find any published research on the subject, but it looks fairly conclusive to me that there is a direct link between AHI and humidity settings. Does anyone else have any observations? Absolutely nothing else changed. And I rarely drink much in the evenings. I sent you a screenshot of the data, feel free to pass it on if you want. Yes, just been looking at it. I'll be interesting to see what others put. I didn't change my humidifier settings last night, but I did have a night of feeling very hot and kicking off the duvet every so often. My AHI last night was 12.5 whereas the night before it was 4.5. Hope someone else comes along with some insight. Let's take out of the equation the odd bad night - everyone suffers an uncomfortable/disturbed/can't get to sleep night every now and then. However, we can induce bad nights by not paying attention to changing weather conditions. For instance, the weather had been good with warm-ish nights for a while and suddenly it turned cold, so the central heating started and the bedroom may have been warmer, thus causing kicking the duvet around. I think what Daryll has experienced is more likely to be about rain-out. It's still well cool enough in the wee hours to cause condensation in a PAP hose if the humidifier is turned way up. Not the full on rain-out of mid-winter but the odd droplet splashing your face every now and then is sure to disturb you. The droplet splashing would increase with an increase of humidifier setting - unless - everybody together - you use a heated hose or maybe just a snuggie at this time of year. I have a 'weather station' in my bedroom - an electronic gizmo that tells me the time, temperature in the room and outside the window (because that's where I placed the sensor) along with the humidity. In the spring and autumn, it's a grerat help in deciding whether or not to switch on the heated hose or the air conditioning in the summer. My object is to maintain ambient conditions in my bedroom within the range that is most comfortable for me so I get the best sleep I can. And every now and then, I have a bad night, too. It was not rain out.. I use nasal pillows, and I know rain out... all my pipes are insulated anyway. If Kath thinks it appropriate, I have sent her the graphs which seem to show quite a definate correlation. The high AHI's correlate exactly to the nights were the humidity was raised. My initial results were immediate with CPAP and textbook, and I was discharged within months, but this increase was so definite.... and followed the increase in humidity settings exactly. You are welcome to post them on here Darryl. I was merely pointing out on my post that an increase of heat (hot flushes in my case) raised my AHI, and increasing a humidifier when not necessary seems to create more heat too, which is why I was wondering if your AHI shot up. Obviously lots of different things can raise our AHI, but I get your point in that you were carefully testing your raised humidification. 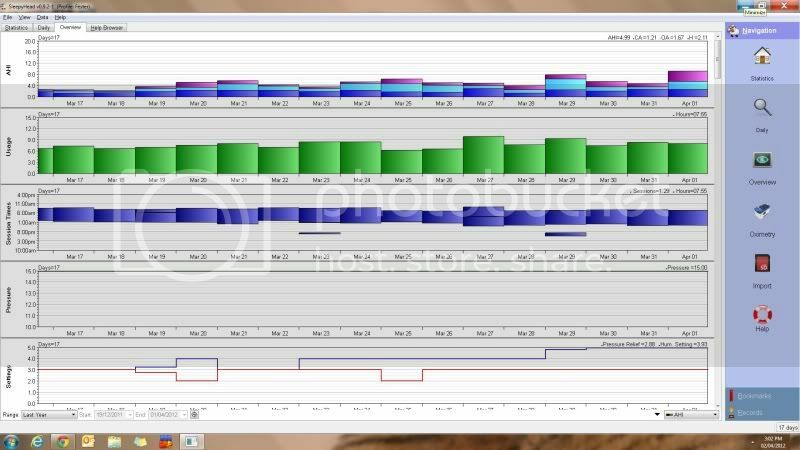 here is a screen shot of one of the graphs. NOTHING else had changed! Darryl, as we are on opposite sides of the world our temperatures are pretty much the opposite, but I find the same, when the temperature goes up so does my AHI. The hotter it is the more my AHI goes up. I try to keep the air cooler in summer by running a small fan but here when we have nights in the mid to high 20's it is difficult to keep a consistent temperature. I have a double story house and the temperature upstairs is normally 5c more than downstairs, as I also have a weather station. Just a theory but I think in the hotter weather at night we find it harder to sleep and breathe and we move around more in bed. AHI's can be recorded by moving in bed, coughing etc not just apnea's as our machines are not an exact science like a sleep study. I think to answer your question, as long as your AHI doesn't stay up over 5 for weeks at a time you are fine and you can be the curious scientist and see what variances there are between hot and cold weather as time goes on. Last night, I reduced the humidity down to 2, but we had friends round, and I had rather a lot of Red Wine, and Malt Whiskey, yet my AHI still plummeted from over 9 (no alcohol but humidity 5) to an AHI of 5. So if tonight with no alcohol, it goes down again, I would say it is fairly conclusive. My theory is that at higher temperatures/humidity levels, as the night goes on, the walls of the airways become "saturated" for want of a better word, and act like the core of a roll of toilet paper when it is wet...."goes soggy and collapses more readily." The warmer air is, the more moisture it is capable of holding, with or without a humidifier. Darryl, I like the way you think, but I'm not really sure that the test you did, especially with alcohol would hold up lol. As alcohol is a depressant, I would have thought it would make your AHI go up, possibily. I know there are some Dr's on the US website and would love their thoughts. I think it would be easier to turn your humidity down in summer and up in winter but maybe that's too simple. I usually never drink. Last night was a one off, so I was very surprised to see the AHI go down. Made me think the humidity has a greater effect than I originally thought. It all started after I was waking up with a dry throat and nasal cavity, presumably due to the pressure. I am going to leave the humidity low now, as i would prefer to be dry in the mornings rather than have high AHi's. I think it would be an idea for some of the Drs to do some proper tests, and maybe issue advice to clinics about appropriate pressure/humidity combinations to compensate. Look forward to more stats from you Darryl without the alcohol and keeping on reducing the humidification. The problem with last night's with the alcohol is that if we go into REM sleep with alcohol, then our AHI shoots up, but sometimes (often with more alcohol than is good for us) we don't hardly get into REM and spend most of our time in the lighter stages of sleep, so the AHI won't show high readings. Hope this makes sense.